Yes, I am fully aware that I am posting this on December 26th, and not December 25th. That's because the big Wyatt family celebration no longer occurs on the actual day of Christmas, so that it better fits into the packed holiday schedules of all the assorted branches, twigs, and leaves of our family tree. It's more important to us to be all together than to have the celebration on a specific day. We did have a smaller gathering on Christmas Day, but there were no presents and no special activities, just tasty food and good company, so I skimped on the photo-taking. Three generations -- Me, Grandma Betsy, and Mom. It's a little repetitive, but it's such a good photo of the two of us that I wanted to include this one too. I'm not quite sure how I became the family expert in pigs-in-a-blanket making, but it has been my solemn duty for years now. This year's batch was by far my most challenging, as the cans of Crescent Rolls exploded dough shrapnel all over the kitchen, and I had to perform a salvage operation using the remaining scraps to wrap up the Little Smokies. It was touch and go for a while, but they turned out fine in the end. 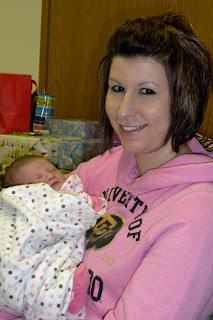 New mommy Aimee with Mya. Avery and Abbie are close in age, and were play buddies all day long. Here they are opening gifts together. The one picture I got of Will when he wasn't crying, and he's picking his nose instead. Braden is on the left. 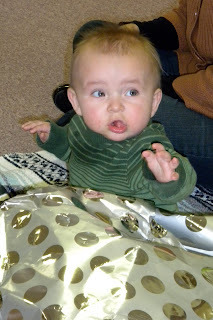 Baby Ben liked the wrapping paper almost as much as the gifts inside. 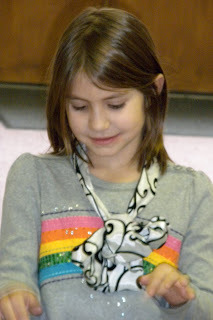 Madelyn, sporting a fetching ribbon necklace. Jalen, completely engrossed in tearing open one of his gifts. My default position for the weekend, cradling a sleeping Mya. 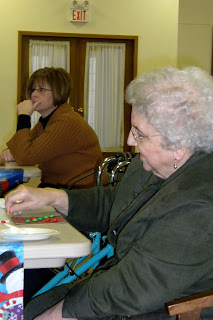 Mom and Dad had a great time calling the second annual Bingo game. My prize was a bright pink Snuggie, the photo of which I have omitted upon discovery that the Snuggie is perhaps the least figure-flattering contraption ever devised. Ben is a squirmy bundle of smiles, and he and Mom had a blast entertaining each other. Abbie and I were headband twins, even though she left her red one at home. It was a great day. Everyone had fun, and we narrowly avoided disaster when Aunt Brenda's dog Missy escaped its harness when it was being walked outside. Cousin Jason became the hero of the day when he found Missy down the street and brought her back. With a major crisis averted, we can all reflect fondly on a day of rambunctious children, traditions new (Bingo) and old (the pigs-in-blankets), good food, and family unity. I am blessed to have such a large and happy family, and that so many of us are able to be together for this special time each year. I, for one, am already eagerly looking forward to Christmas 2010!